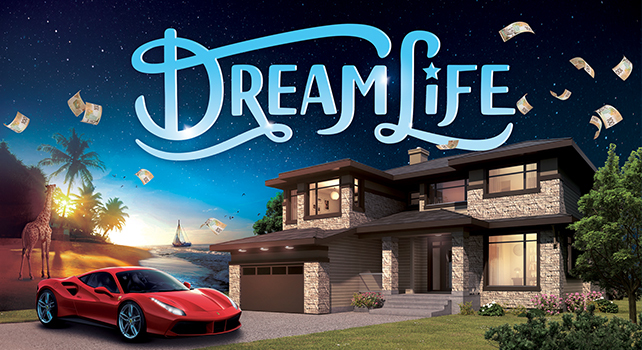 DreamLife Lottery’s Gale Force Wins! DreamLife’s $2.1 million Dream Home is our biggest yet, and, together at last, it comes with a beautiful, expansive dream yard. The Early Bird Prize is a red-hot Ferrari 488 GTB worth over $324,000. And that’s just the beginning of the winning. There are shopping sprees, Choose-Your-Own Vacations, and a fleet of absolutely stunning vehicles. With our biggest Split 50 max pot ever, and a $100,000 Christmas Eve payday during our 12 Days of Cash, DreamLife Lottery is giving away more cash than ever. Ticket sales are open now. Don’t miss out on these gale force wins.